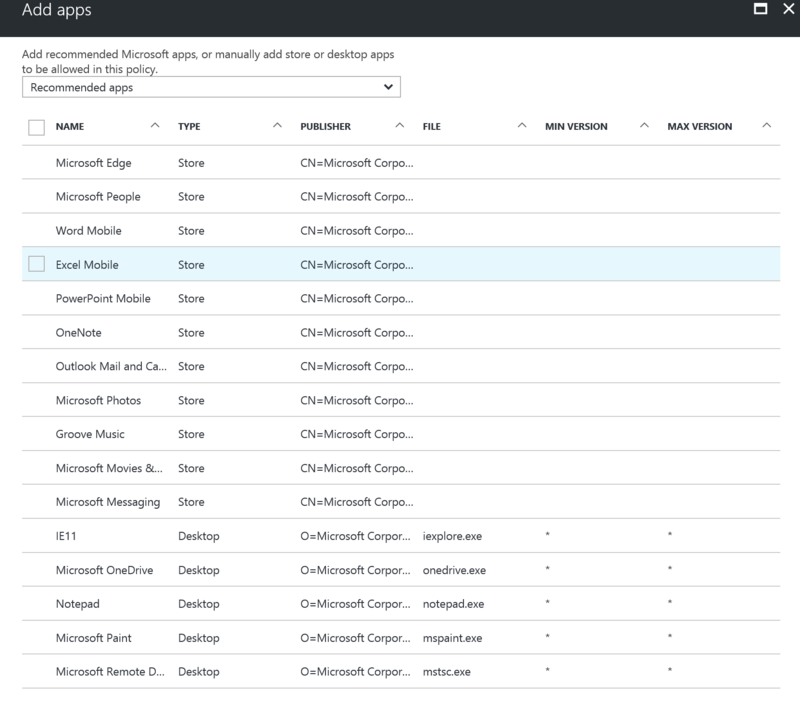 A few weeks ago I made several posts about Azure Active Directory Preview in the Azure Portal, and this week it’s time to start looking at some of the Intune preview capabilities in the Azure Portal. 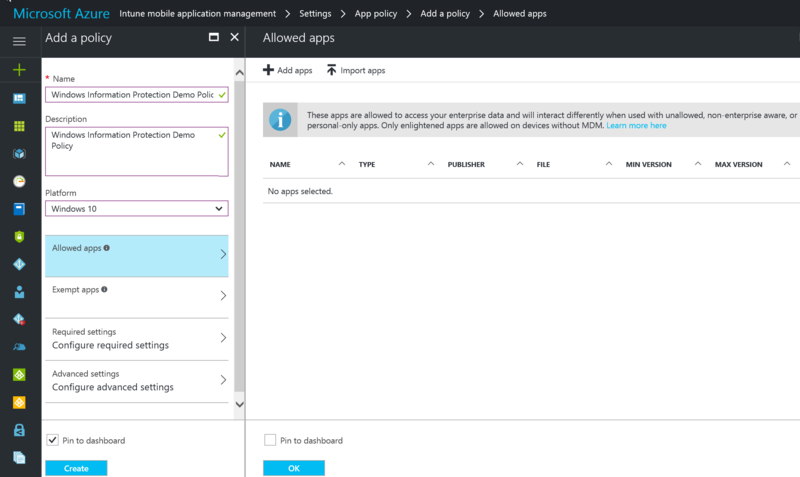 Today I’ll start with Windows Information Protection, which has moved into the Intune Mobile Application Management blade. Previously this is where the Platform choices (highlighted above) only showed iOS and Android, but now we have Windows 10 making a long overdue appearance. Once I fill out the Name and Description I choose to Add apps. 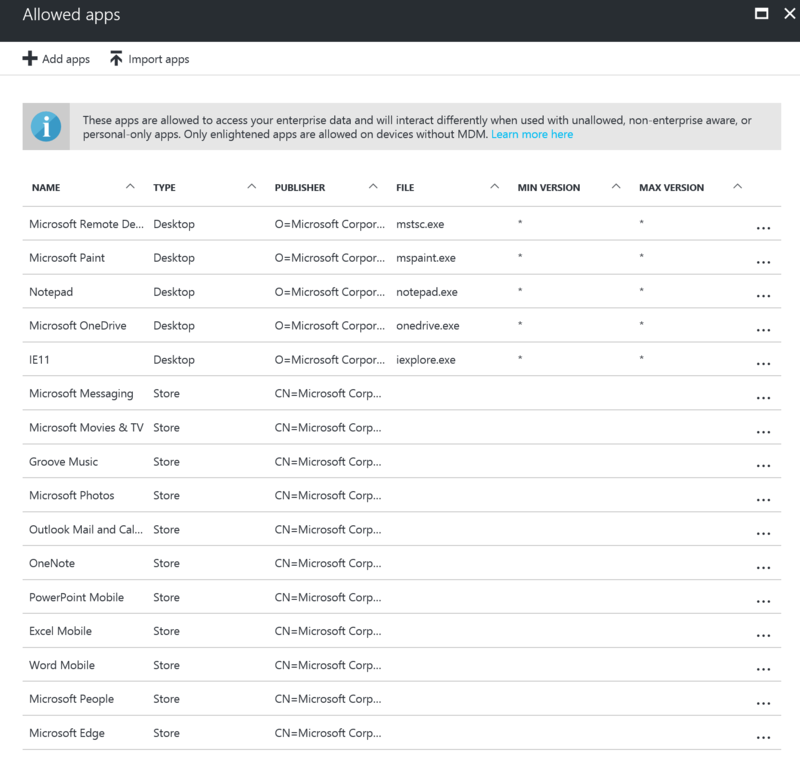 Add Apps provides the option of adding Recommended Apps as one of the options, which you can see is a collection of Microsoft Desktop and Store apps. Once the Recommended Apps have been added (you don’t need to select them, or select them all), you can then choose to customise the app list further by clicking Add apps. Now we can add Store apps. We can also choose to Import apps via AppLocker XML files. We can also Add apps that are exempt. that should look familiar if you have configured WIP from the Silverlight based classic Intune portal. The first page of Configure advanced settings gives the ability to start identifying the trusted network boundaries, and how Data protection should be enforced. Enabling Windows Hello for Business as a sign in method is also configured here. Finally we need to deploy this, so we need to choose Add user group and then we can target the users we want the policy to apply to.